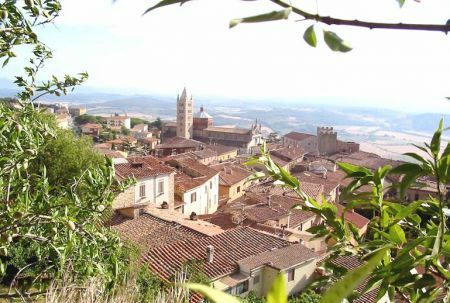 Click here to find holiday accommodation near Massa Marittima. The name "Marittima" refers to Maremma rather than anything to do with the sea and, indeed, Massa Maritimma is quite distant from the coast. "Massa" is simply a mediaeval latin word meaning a group of landed properties. Massa Maritimma is divided in three parts called "terzieri", a division that made its appearance in the 13 C during the transition from feudalism to a municipal form of government. At the beginning of the 13 C, the first village established itself in proximity to the Castello di Monteregio which, as the residence of the Prince-Bishop, was built on the highest point of the hill. In 1225, after the city was liberated from the Bishops and the Free Municipality had been proclaimed, work was begun on the public buildings necessary for civic life and which are now known as the Città Vecchia (Old City). The Cathedral, the Bishop's Palace, the Palazzo del Podestà, the Town Hall, the Loggia del Comune, the Mint and the public fountain are all clustered around the main piazza from which the streets of the Borgo (the village), where the artisan shops were located, descend towards the gates. During the first half of the 13 C, the large increase in population that resulted from the favorable social and economic conditions created by the new institution of the municipality made it necessary to enlarge the built up area. This extension, known as the Città Nuova (New City), arose in the immediate vicinity of the Torre del Candeliere, which was just then being completed. The Church of S. Agostino was built to replace the older S. Pietro all'Orto, the latter being by then too small for the needs of the town. In 1335 Siena conquered the city and put an end to the Free Municipality, leading to a period of economic decline and depopulation. A few years after their victory, the Siennese built the Fortezza, connecting it with an arch to the Torre del Candeliere, and a new set of city walls, which still divide the Old City and the Borgo from the New City. Click here to learn more about Massa Marittima. Alta Maremma © ammonet website hosting 2007 - 2018. All rights reserved.